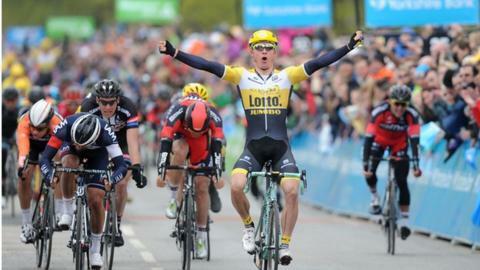 Moreno Hofland sprinted to victory on stage two of the Tour de Yorkshire. The Dutchman won by a bike length after the 174km-stage from Selby to York to earn a first win of the season for his Lotto-Jumbo team. A seven-man breakaway was whittled down to two and swallowed up with less than 3km to go. And in a sprint finish, Hofland got up to beat Matteo Pelucchi of IAM Cycling and Giant Alpecin's Ramon Sinkeldam. Team Sky's Lars Petter Nordhaug remains in the leader's jersey, extending his advantage to 10 seconds over Samuel Sanchez and Thomas Voeckler. Sunday's final stage is 167km from Wakefield and passing through Holmfirth and Hebden Bridge before finishing in Roundhay Park in Leeds. Before the men arrived in York, the women's race took place. It was four laps of a 20km circuit and Louise Mahe of the Ikon Mazda team took the honours ahead of Eileen Roe, Katie Curtis and Charline Joiner. Mahe praised the atmosphere as cycling fans lined the route. "The race was really fast the whole time," she said. "The average speed was 24.7 mph so it was really quick. You looked back and it was strung out so you know everyone is going hard and people are clinging on."